THE BULL TERRIER CLUB OF VICTORIA INC. Thank you for taking the time to look at our page. Here you'll find information on Bull Terriers and our club and hopefully enjoy looking at the other information provided on this site. The Bull Terrier Club of Victoria Inc. was founded by a dedicated group of individuals in 1975 with the objective to promote the breed, educate people about Bull Terriers, organise specialty shows for breeders, and act as a club for enthusiasts for all matters relating to bull terriers including health, breeding, showing and public image. 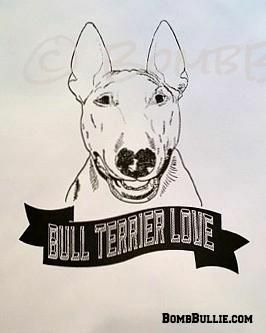 The Bull Terrier Club of Victoria Inc. club organises shows with local and international judges and encourages people to exhibit their main registered pedigree Bull Terriers. Along with the shows there are other events for Bully lovers to enjoy such as Bully Walks, Members Comps, Expos and competitions. These events are scheduled throughout the year, and are held at various locations around Melbourne and are usually accompanied by a sausage sizzle. If you want to meet fellow bully lovers please come along and help us to educate the public on our wonderful breed. Everyone is welcome! The BTCV Inc. club also regularly attends Pet Expo's and other breed information days to promote Bull Terriers. The BTCV Inc. also offers support on a range of topics such as how to purchase a registered pure bred puppy, information on showing, health and temperament. Our club has members and committee who have been involved with bull terriers for many decades and can offer a range of advice and solutions. You don't have to be a member to ask for help, please contact us if you have any questions regarding Bull Terriers, or just come along to our next event. ​Protection for the pedigree bull terrier. Registered breeders aim to breed bull terriers that meet the breed standard. They are always aiming to keep the breed consistent and improve on any conformational, temperament and health defects. There is a lot of time, research, money and education that goes into breeding the best bull terriers. Members receive a regular newsletter and discounted show entry fees. Member support helps us fund the many activities we do to promote the breed. If you love Bull Terriers or are interested in owning one, please consider joining our club. If you are interested in showing or breeding bull terriers then we strongly recommend you join the club and network with our many member breeders who may become valuable mentors to you. Please contact the secretary for further information on becoming a member or about any of our activities.